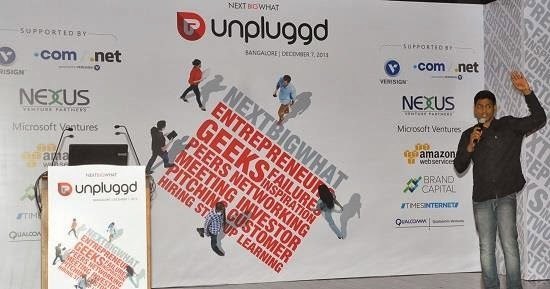 NextBigWhat came up with the winter edition of the startup conference, Unpluggd. In the last edition, Vishal Gondal’s talk lit the fire in me and this time it was Paras Chopra, Founder & CEO of Wingify, who caught my heart. Here is the bootstrapped story of Wingify, an A/B testing company built by Paras, who learnt programming early in his life, but chose to major in biotechnology because he wanted to learn something new. Wow! that’s a cool attitude. He got inspired by Paul Graham’s essays, listed all his interests on a piece of paper, picked the top one and went on to startup. Having done a few failed college projects similar to start ups and starting up Kroomsa, a platform for independent bands/artists, Paras was in his own fantasy world dreaming of Kroomsa’s massive hit. He wanted the world to notice though nobody noticed, he said. He later realised that he was not marketing well and wanted to hone those skills, went on to share the subsequent products with Hacker news took the feedback and was heart broken. In his words, “I wanted to die. What doesn’t kill you makes you stronger.” Paras said, making a comprehensive kichdi confuses users, whose attention span is less and nobody goes through help section. Usability and user on boarding is very important. Focus matters and he focused on just one feature after dumping so many other efforts he had put in. He advised on involving potential user from day one, focusing on customer feedback, being close to them and rapidly iterating on the feedback. Competition can copy the product but not the culture and customer service. Getting covered on tech crunch, writing in lots of places, blogs, case studies, twitter, reviews and through inbound content marketing, Wingify positioned themselves as thought leader in their area. There were established players like Google Website Optimizer and Omniture who were competitors of Wingify, but he had priced the product substantially low because his initial humble goal was a simple revenue of Rs. 50,000, which was the salary he was getting that time. Fortunately they got a first month revenue of $4000 and touched one million dollar revenue in 18 months. That’s a quite nice money and Wingify now has 3300 customers across 70 countries. VCs eventually started contacting, but Paras believes that funding is not a milestone. That is a misconception. Funding is like home loan. You don’t celebrate when you take home loan. It can make sense when you have a precise plan. Also realise that investors are not friends but partners. They have some legal clauses that can thwart your way of running a company. On stressing the importance of a co-founder, Paras said we can’t rely on employees for everything and need someone with whom we can share stuff with and for that matter, a great co-founder is good. We need to figure out someone with whom we share a good relationship with and not sure how people are confident posting something like ‘looking for a co-founder’ on job sites. And before closing, he reiterated that India can build great product companies and Wingify wishes to be one. Focus on prototyping instead of pitching. Sales is a serious business and it should be sales, sales and sales in the first year. The first sales person is really important and one simple way to hire him is by looking at his past performance. Talk to potential customers. Persuade. People are always ready for a cup of coffee. Investors are not always right. Focus. You are in the drivers seat and can’t take your eyes off the road ever. There is no room for distractions. Your company is only as good as your writing. Take risks. Focus on cash flow. Bring in paying customers without delay. Create a team who can run as fast as you. Scale the product along with continuous improvement. Put all the money back into the product initially. Invest in R&D. Outperform on the promises. Delighted customer is a multi million dollar marketing campaign. Hiring across continent is a biggest leap of faith for an entrepreneur. Get the top notch sales people. You might not win every battle, you ll have to find the perfect fit. Research your customer well. Associate with someone who wants to be no. 1. Offer something that the customer can’t get anywhere else. Test the market early. Do not keep the idea an ultra secret. That will not help. One way of approaching a probable partner is to find a rising star in a large company who is ready to take risk to prove himself and proceeding through him. Very soon go for paid pilots, build relationships and establish processes. Sign an NDA as early as possible and be serious about each other. Have a good cop and a bad cop to tackle issues with customers. Maintain the exclusivity and advantage over pricing. Aprameya said TaxiForSure was a serendipity and I later found that they have even named their company as Serendipity Infolabs. Being hands on has helped them develop the back-end system and he stressed on the importance of being frugal so as to achieve more with less. On being asked on how he had changed to suit the needs of the business, he said he learnt to speak the language of operators, with whom they collaborate with. “When I’m old and dying, I plan to look back on my life and say “wow, that was an adventure,” not “wow, I sure felt safe.” Tom Preston-Werner. Charge your customers. Charge you customers higher. Focus on inbound marketing & organic growth. People, Product, Culture. 4 people, 11 months, 40,000 brands, 3000 paying customers and 1+ million dollars revenue. Besides all these, he was humbled by the fact that Sachin & AR Rahman are using his product. What else?